The Caribbean is a giant melting pot of flavors. Flavors influencing Caribbean cuisine come from India, Africa, Asia, and Europe. Caribbean food is bold, flavorful, spicy, hot, fresh, and truly representative of a world cuisine that stands on its own. There are 32 island countries and territories in the Caribbean region that is considered the "West Indies"—the Greater Antilles (Cayman Islands, Jamaica, Dominican Republic), Lesser Antilles (Barbados, Saint Lucia, Trinidad, and Tobago), and Lucayan Archipelago (Bahamas and Turks and Caicos). Just as there are many different islands, there are many herbs and spices used in Caribbean cooking. Take a look at the top five spices that are used widely in the Caribbean for both savory and sweet preparations. Allspice is a spice that comes from the dried fruit of the allspice evergreen tree or pimenta tree. It not a combination of spices—as commonly thought. It is called allspice because when ground, the spice berries taste like a combination of nutmeg, cinnamon, black pepper, and cloves. Allspice is also known as Jamaica pepper and sometimes pimenta. 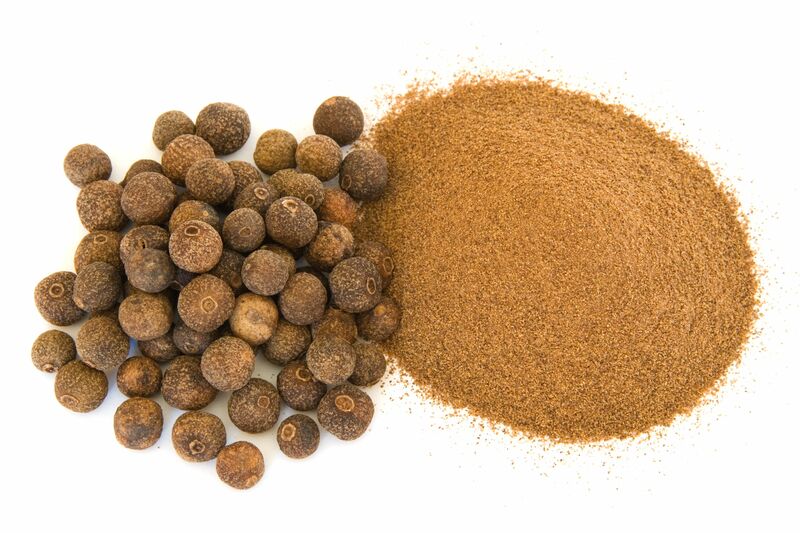 In the French-speaking Caribbean, allspice is used frequently to season seafood dishes and Creole sausage. Allspice leaves are used similarly to bay leaves and are commonly dropped in a stew to add another depth of flavor. Also, the wood of the allspice plant can be used to grill jerk-seasoned foods and impart some flavor. Nutmeg refers to the ground spice from the seed of the fragrant nutmeg tree, a dark-leaved evergreen tree. The seeds are dried gradually in the sun over a period of six to eight weeks. The nutmeg shrinks away from its hard seed coat until the kernels rattle in their shells when shaken. The shell is then cracked open and the nutmegs are picked out. Nutmeg is a pantry staple that is used for beverages such as rum punch and other alcoholic drinks. Freshly grated nutmeg is used to flavor sauces and other savory dishes. A word of caution: Keep nutmeg away from dogs, as it is highly toxic to them, causing seizures, tremors, and nervous system disorders which can be fatal. Cloves are the aromatic flower buds of the evergreen clove tree. You can use cloves for both savory and sweet preparations. One top use of cloves in Caribbean cooking is as a component in a curry sauce. Cloves can be used whole or ground. Cinnamon is also known loosely as "spice" or "hard spice" in the Caribbean. It comes from the bark of the evergreen cinnamon tree. Most cinnamon used in international commerce is derived from a close relative, the cassia tree. Cinnamon is used in savory dishes of chicken and lamb, a popular topper for cinnamon and brown sugar plantains, and can also be found in rum punch and the Puerto Rican version of eggnog, called coquito. Fresh ginger root is a must-have in every Caribbean kitchen. Fresh root is used grated to flavor a number of savory dishes like Caribbean ginger and garlic chicken. One of the more popular drinks in the Caribbean is ginger beer. It is the key ingredient in a Dark and Stormy drink, a cocktail mixing ginger beer with dark rum.